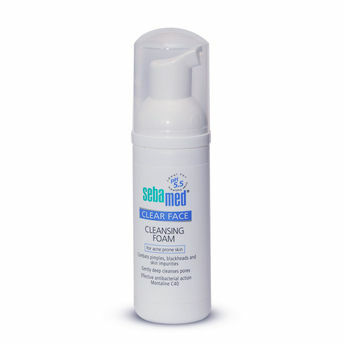 Balance out your oily skin and help your acne to heal with Sebamed's Clear Face Cleansing Foam. Great as a daily cleanser, it is ultra-hydrating without draining your skin of moisture. The refreshing foam gently removes oil while the special formula fights pimple-causing bacteria without making your face red or shiny. Sebamed Clear Face Cleansing Foam ensures the gentle and effective deep cleansing of the pores to combat pimples, blackheads and skin impurities. The mild soap and alkali free wash active substance removes excessive sebum, desquamation and dirt particles without drying the skin. The new coconut oil-based ingredient Montaline C40 improves complexion. Vitamin B5 supports the natural regeneration of irritated skin. Sebamed Clear Face Cleansing Foam is adjusted to the skin's natural pH value of 5.5, supporting the biological barrier function of the skin's acid mantle to help prevent new pimples from forming.